Is Star Wars Day (May the fourth, naturally) a day you look forward to every year? Are Star Wars crafts your jam? 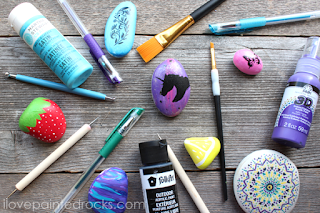 This easy rock painting craft is perfect for people looking to get in touch with their dark side. It's easy to make and is a fun rock painting idea for May the fourth OR "Revenge of the fifth." Check out the demo video below to see how I made it! 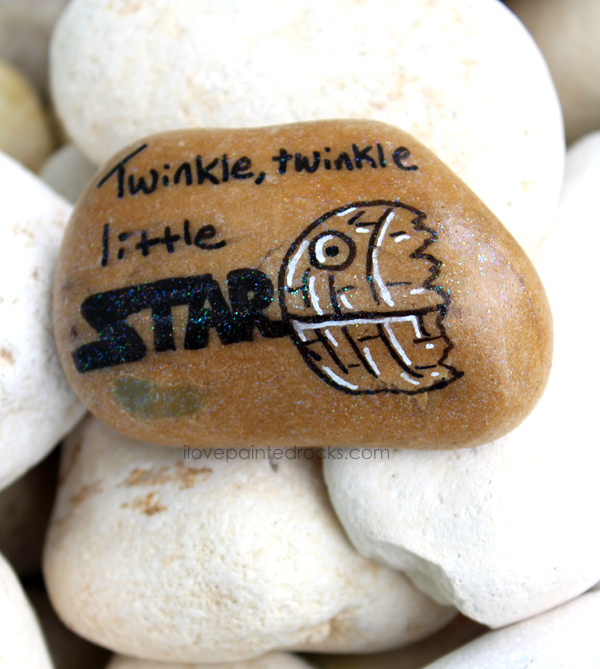 If you are inspired by this Star Wars rock painting idea and decide to make your own, won't you share? Keep in mind that to keep this Star Wars rock painting video short, its sped up and any parts where elements are drying is left out! Be sure to let the rock dry in between steps for best results! Use the Black, extra fine tip Posca paint pen to write "twinkle twinkle little" on your rock. Use your very best handwriting, of course. Watch how I draw the Death Star in the video. It's basically 3/4 of a circle with an equator, a circle in the upper left with a dot, vertical lines following the curve of the circle and a jagged edge on the right. Use the white, extra fine tipe Posca paint pen to add highlights as shown in the video. I wanted to write "STAR" in a Star Wars style of writing. I pulled up an image of the Star Wars text and started with the T to draw out the word "STAR" following the same style. Let the paint pen dry completely. If you don't want your rock to sparkle, skip ahead to step 5. If you love the glitter look because it reminds you of all the other stars, break out you Martha Stewart Decoupage Medium in Sparkle Finish and lightly brush it over the image. work quickly and try not to work with the medium for too long or it will start to smear the paint. Use a clear spray sealer to seal the rock. Whenever I am working with glitter, I like to seal it once, let it dry for about 20 minutes and seal it again. This helps make sure the glitter will not come off the rock and become litter contaminating the environment. 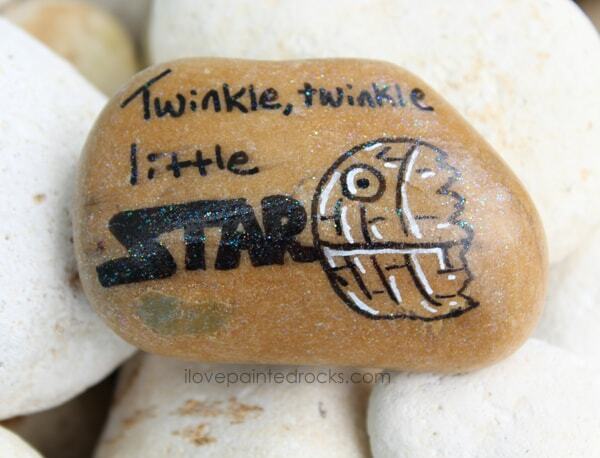 If you love this Star Wars rock painting idea, don't forget to save it for later!